Natural stones such as SOLNHOFEN or MAXBERG® Jura Limestone were created over the course of millions of years and are still being created. “Mother nature” does that – artificial energy is not necessary. As natural building materials, they do not contain any harmful substances at all. Limestone is created from biomass and is therefore completely radiation free. During the entire mining cycle, treatment and recycling nothing is lost. 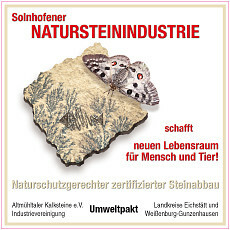 Even among the various natural stones, SOLNHOFENER Natural Stone is also outstanding with regard to sustainability. The energy expenditure for the mining is extremely advantageous (by hand with a wooden axe master), the surfaces are often even used quarry rough, and the treatment process is simple. The environmental sustainability is therefore positive through and through. A building material with enduring value for healthy living that is environmentally friendly. The endurance and durability of SOLNHOFENER Natural Stone and MAXBERG® Jura Limestone is extremely good. While many building materials loose their beauty over the years, real stones often gain attractively through their natural patina. Additionally, the majority of stones can be cleaned or sanded down so that they are refurbished almost to their original condition. A study by PE International, a renowned team of experts for questions regarding sustainability, confirms the excellent eco-balance of natural stone facades. The natural stone facades exhibit clear advantages throughout the entire lifecycle of the building. The great insulating effect of the non-bearing rear ventilated facade leads to significantly reduced heat loss in winter and less need for cooling in summer. But they not only perform better than comparable facades in primary energy usage, but also with regard to the greenhouse effect. You can request this study on facades from SSG. The SSG Group is dedicated to environmental protection and supports the reduction of the greenhouse effect in many ways, not only in companies but also beyond. 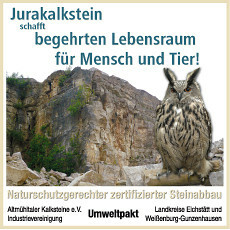 SGG works in the co-founded Pact for the Environment for the Altmuehltal, for example, which is committed to supporting wildlife conservation and for the creation of biotopes. Especially in inoperative quarries, valuable biotopes can be created with targeted measures.